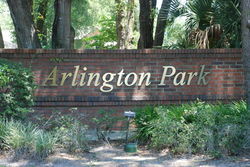 Arlington Park is a small subdivision located of Markham Woods Road at the intersection of EE Williamson Road in the upscale Markham Woods corridor. There approximately 16 large custom homes built in the 1980’s. Each are on wooded lots of one acre or more. Shopping and restaurants are nearby to the south along SR 434 and to the north along Lake Mary Boulevard and Heathrow’s Colonial Town Park and Park Place. Access to I-4 is excellent via the interchange at 434 and I-4.